At the end of the last column I promised to include some more examples of thermal mass this week along with a photograph. As a reminder, thermal mass is part of the trilogy for passive solar design, which also includes solar gain and insulation. Thermal mass absorbs heat from sunshine slowly during the day and then releases it at night. In this way it is a bit like the opposite of a night store heater, which stores cheap electric heat at night and releases it throughout the morning. In modern houses, thermal mass can take the form of an insulated concrete foundation slab, but retrofitting a 100 year-old villa is a different story. Because an old villa has a raised floor (ie, built on piles) adding thermal mass inside of the thermal envelope is more of a challenge. During the renovation of our villa we added mass in three ways. The first and easiest way we added thermal mass was to add a layer of plasterboard (aka “Gib”) to a number of north-facing internal walls that receive direct sunlight during the winter months. If you have ever lifted a sheet of plasterboard you would know it contains lots of mass. In other words, it’s heavy. The next way we added mass was to install an iron claw foot bathtub in our northwest-facing bathroom. Like the extra layer of plasterboard, the iron slowly absorbs the sun’s warmth during the day and releases it at night. Finally, and most dramatically, we installed an old Shacklock 501 cooker in the kitchen. The placement of the Shacklock ensures that it receives direct sunlight three times a day through three different windows during winter. The cooker weighs 300 kg, and is surrounded by another 300 kg of bricks. The insulated hearth accounts for another 100 kg. 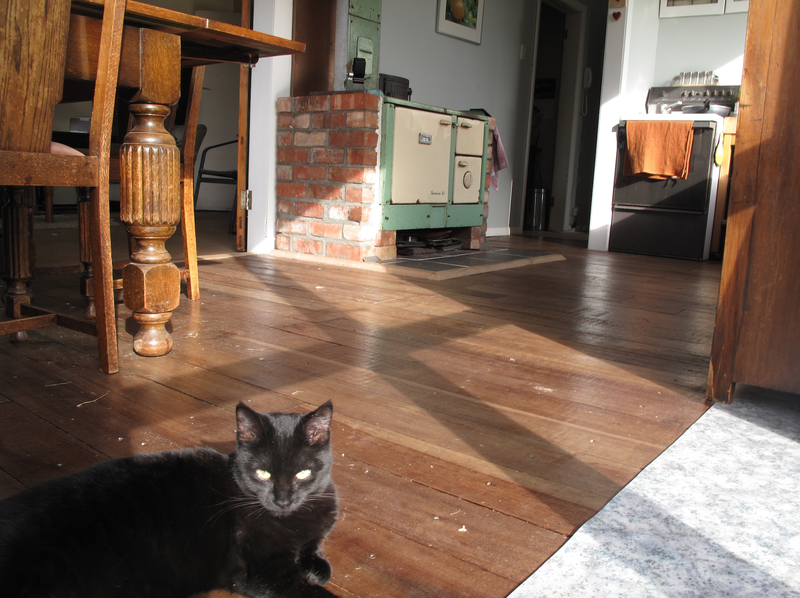 All in, the 700 kg heater/cooker works great as thermal mass during sunny winter days. It moderates the kitchen from overheating during the afternoon and helps ensure the morning temperature is a little higher than it would otherwise be. Oh, and on cloudy days we stoke the Shacklock with wood and cosy up with a big pot of soup on top and a loaf of bread in the oven. For the last two and a half months I’ve shared examples of good home design from around the world. In a nutshell, good design includes using natural energy flows to heat and cool a structure. Natural energy flows include sunlight for winter warmth and wind for summer cooling. A common term used for this approach to building homes is ‘passive design’. 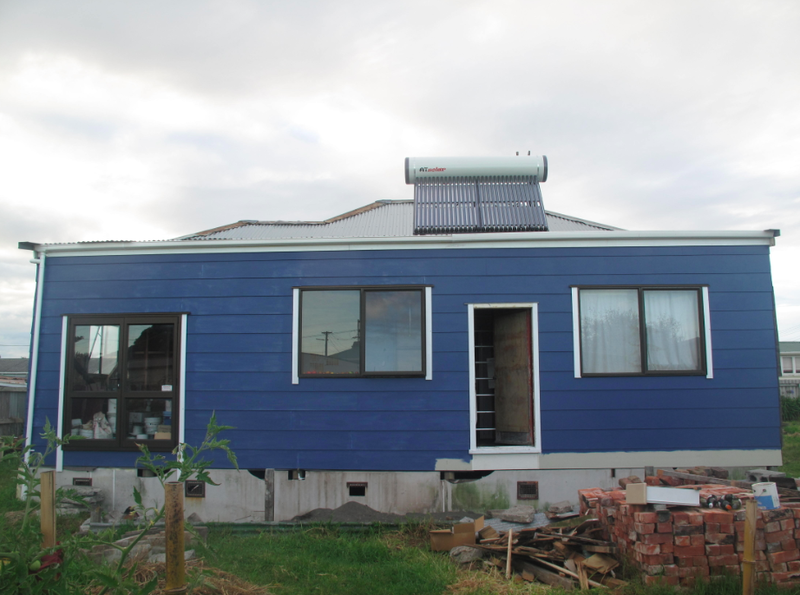 This approach to housing allows a well designed home to ‘just sit there’ and achieve comfortable temperatures year round with low power bills. From desert to mountain, and from the tropics to cool temperate regions, I have included seven styles of homes so far in this column. For the eighth example I am offering a twist, because who in their right mind would include a 100 year-old New Zealand villa as an example of good home design? However, the process of transforming a cold, draughty villa into a cosy, warm home is only a matter of following the basic design principles from other high performance homes that we can see around the world. Just as a reminder, the basic design elements are these: solar gain, thermal mass, insulation, cross ventilation, and a centrally located fixed heating source. The first challenge of turning a century-old villa into a passive solar home is increasing glazing to the north and decreasing glazing to the south. In other words, this means adding windows and/or glass doors to capture more winter sunlight and removing windows or glass doors that receive no direct winter sun. This type of work is more than likely to require building consent, so make sure you do your homework. Special care must be taken to not compromise the bracing of the home or its weather tightness. Any northerly facing window is likely to provide an ample supply of free winter heating as long as the sun is not blocked by trees or neighbouring buildings. Once you have checked on potential winter shading, decisions can be made on increasing the amount of north facing glazing. At the same time, southerly facing windows simply lose heat from a home almost continually from May through August. Replacing some of these cold windows with insulated walls will hold more warmth within a home, but remember all work needs to comply with the building code. Next week I’ll tackle the misunderstood issue of thermal mass. Editor’s note: This is the second of an eight part series. Last week I introduced the concept of passive design using the ancient cliff dwellings of Mesa Verde (Colorado, USA) to illustrate the point. 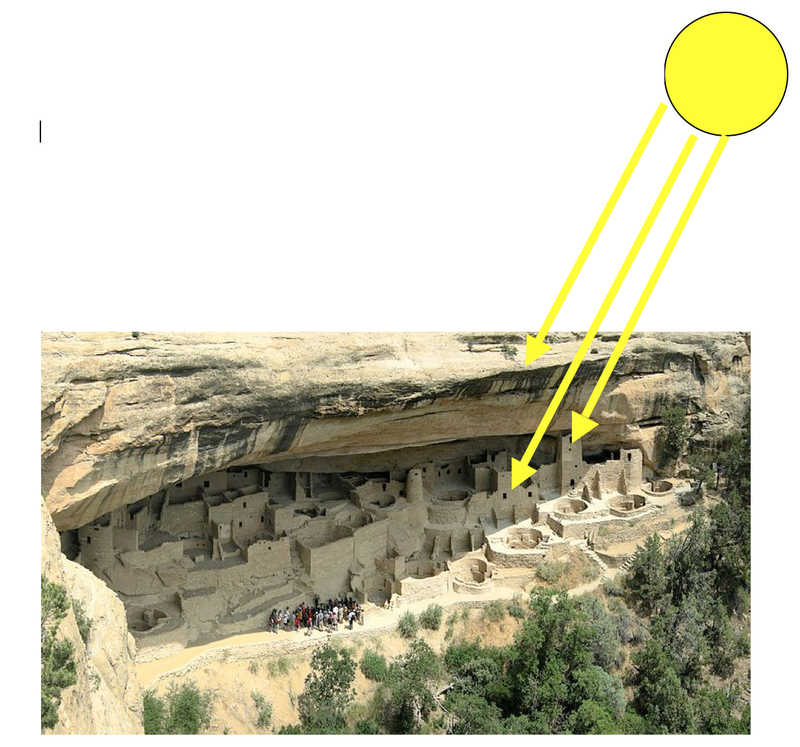 In a nutshell, the “Ancestral Pueblo Peoples” – also known as the Anasazi – chose certain cliffs that excluded the hot summer sun but welcomed its warming rays in winter. The Anasazi first occupied the caves over 1,000 years ago. Warm in winter and cool in summer: they were no dummies. Here is what we can learn from them: design for the climate; use local materials; harness free energy. Both the Anasazi and the hippies figured out ways to live comfortably in a climate that ranges from 40 degrees in the summer and minus 10 in the winter by using passive design. An Earthship is designed to allow low angle winter sun to reach deep inside the structure but to exclude high angle summer sun. Once the winter sun enters the structure some of it is stored in what is called thermal mass, such as an earthen floor, bricks, tiles and even the earth-filled tyre walls. Believe it or not, thermal mass is essential for keeping these structures from overheating in the middle of winter on cold, sunny days when the temperature outside is right at the freezing point. Thermal mass acts as a battery in that it stores excess energy (in the form or heat) during the day and releases it at night. Of course the Earthships also contain plenty of insulation to hold that heat inside the structure overnight. All of this falls into the category of passive design because it requires no moving parts such as fans or pumps, or the electricity to run them. Passive means it just happens by natural energy flows and cycles. Earthships also employ passive cooling systems, but I see I am out of words for this week and next week’s column is all about passive cooling with examples from the tropical nation of Nicaragua. Editor’s note: This is the first of an eight part series. Good home design is not rocket science. Some would say it’s a matter of common sense. But sometimes a lot of bells and whistles get in the way of common sense and we have to step back for a moment. As long as we’re stepping back, let’s step way back – 1,000 years back – to Mesa Verde, Colorado and the cliff dwellings of the “Ancestral Pueblo Peoples” also known as the Anasazi. Mesa Verde is located in the Four Corners Region of the U.S. where the states of Colorado, New Mexico, Arizona and Utah meet. Temperatures can reach 40 degrees in summer and minus 10 in winter. In an average year snow can fall during parts of seven months. Given the building technology available in 1015, what constitutes good home design and how did the Anasazi accomplish it? One reason that Mesa Verde was attractive to them was a series of south-facing (toward the equator) cliffs that were warm in winter and cool in summer. “What’s this?” you say. How so? It all has to do with sun angles. During summer the sun is high in the sky and is largely excluded from the caves in the same way that wide eaves exclude the hot sun from a well designed home. In the winter, however, the sun is low in the sky and its warming rays can penetrate deep into the caves providing warmth and light to the occupants. This would also be true of a well designed home, but unfortunately we do not commonly see it in the existing housing stock of the entire country for that matter. In design language this is called “passive solar design” because it involves no fancy technology or moving parts. It is passive – just like a cat napping in a sunny window or a sun worshipper lounging on a beach. A well designed passive solar home keeps it’s occupants warm in winter and cool in summer using no power other than the sun. Of course new homes can be designed and built to harness free solar heating in winter while excluding sunlight in summer, but many existing homes can be renovated to improve their solar performance. It’s free energy delivered with no service fee. Why not sign up? So what have we learned from the Anasazi about good home design? It should be appropriate to the climate. It should harness free energy. Next week we’ll fast forward 1,000 years to the same region of the southwestern U.S. desert and see how designers and builders have taken lessons from the Anasazi and added a few of their own. We’ve reached the autumnal equinox and there is probably not a person in the city that would not say what a glorious summer we have had. Plenty of sunshine, light winds, and, after an initial dry spell, enough rain to green up the pastures and the garden. But, like it or not, summer will come to an end, and the equinox is a reminder that we are tipping toward winter with the hours of daylight becoming shorter than hours of darkness for the next six months. It is also a timely reminder of how valuable the sun is to life on earth, and what a difference its absence can make. 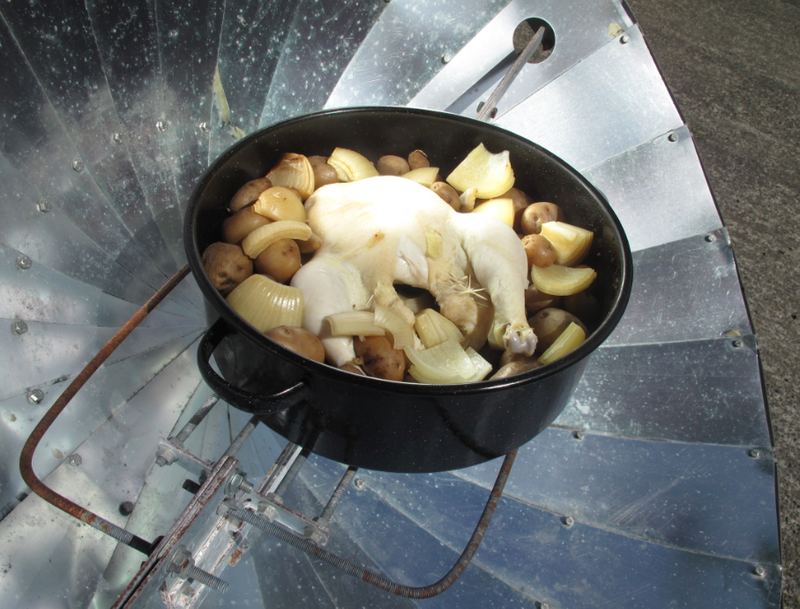 Sadly, no one has yet to invent a lunar cooker, but there are many ways to store solar energy overnight and even for a number of cloudy days in a row. With solar cooking, the best place to store it is in your belly, but other solar storage systems include batteries, water and concrete. Batteries are often used to store electricity generated by photovoltaic (PV) panels in places not served by mains power. Whether it is a yacht at sea or a bach in the wop wops, these situations are often called, “off-grid.” The “grid” refers to the network of power lines that serve the vast majority of us. Obviously, off-grid housing is not vulnerable to mains power interruption, and is therefore valuable for emergency preparedness. Even though our rural home is served by mains power, I am designing a hybrid PV system that will heat our water most of the time but also have a small battery bank for emergency lighting, water pumping, radio and mobile phone charging. Without meaning to offend anyone’s intelligence, a traditional solar hot water system stores sunlight energy in the form of heated water. The energy itself (heat) is stored inside of an insulated cylinder overnight. Depending on the amount of insulation around the cylinder and a household’s hot water use, the supply can last for three or four cloudy days. Solar hot water would also be a treat in the case of a prolonged mains power outage. Sunlight energy stored in an insulated concrete slab is called “thermal mass.” Like solar hot water, the heat is stored overnight and potentially for a number of cloudy days in a row. 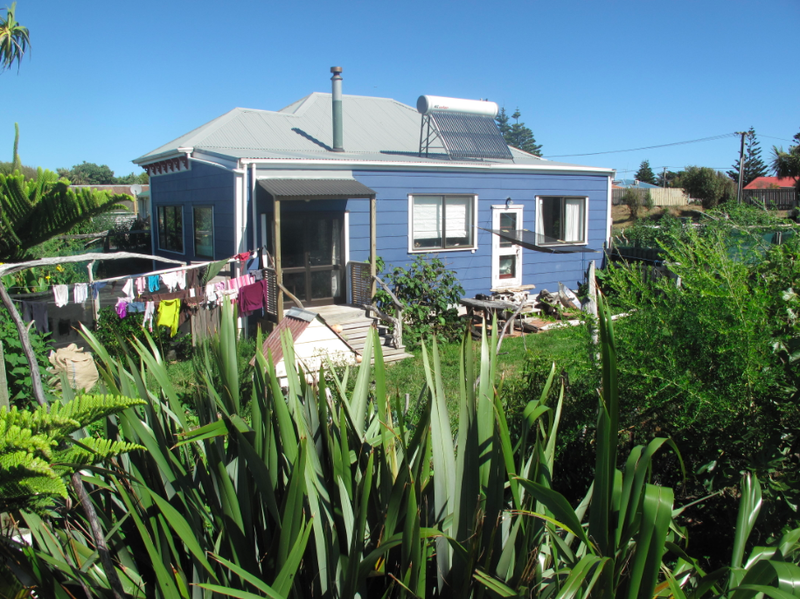 For any new home being built in New Zealand, passive solar design is an affordable approach to a high performance dwelling. Additionally – you guessed it – a passive solar home would serve its occupants very well during a mid-winter power failure if their only heating sources relied on electricity such as a heat pump or plug in heater. 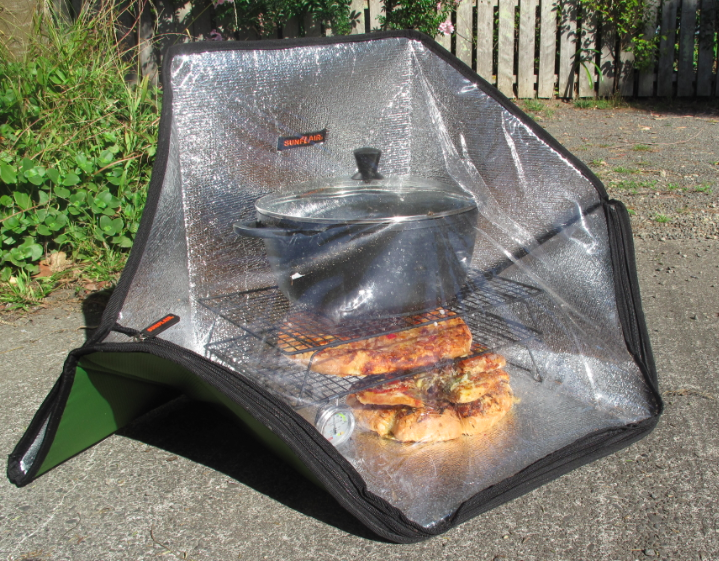 Finally, don’t make the mistake of thinking that solar cooking is only a summertime endeavour. 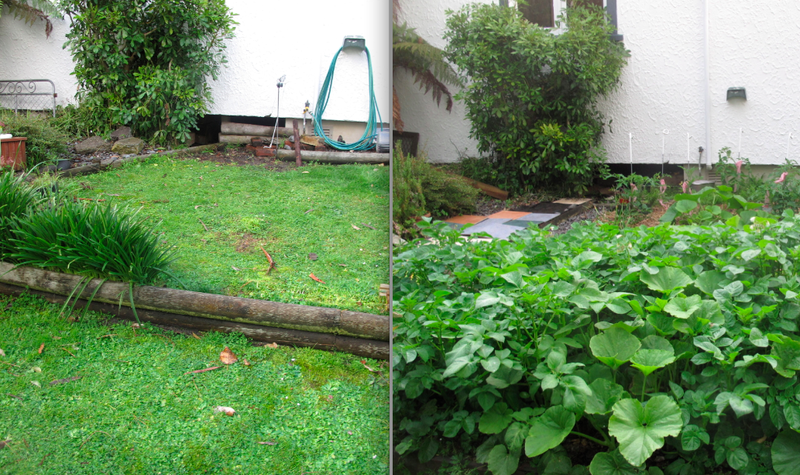 We have cooked through the last six New Zealand winters with great success. 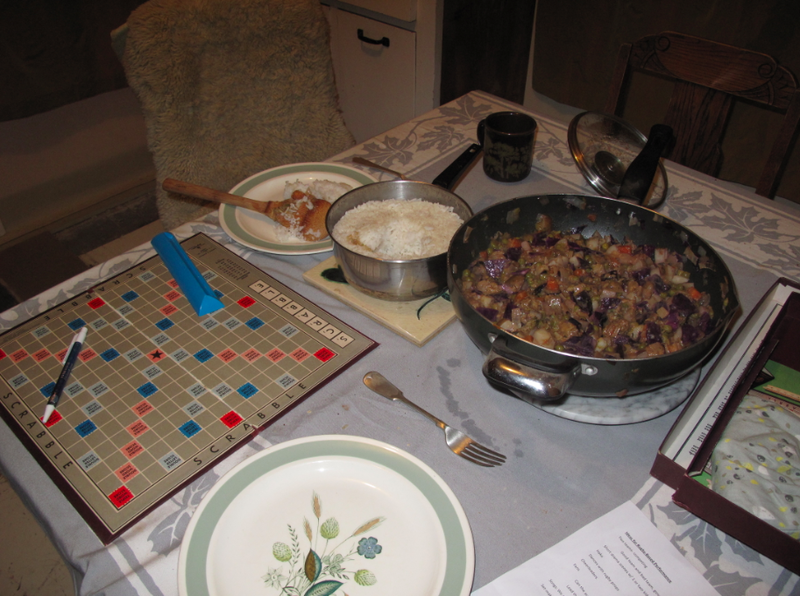 Memorably, during the week-long cold snap in August 2011 when we had snow flurries in Majestic Square, I managed to burn a pot of rice and a curry on the very same day. That is solar power. 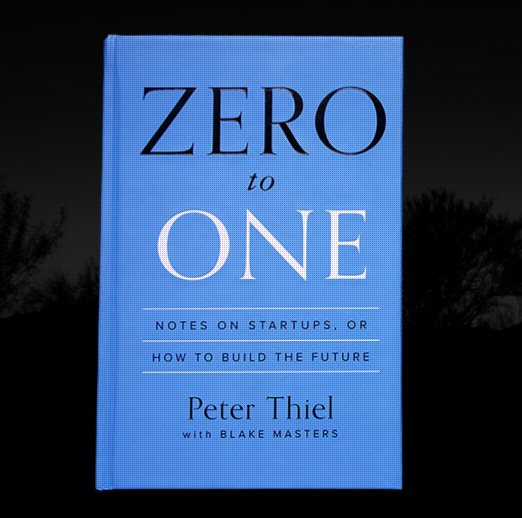 This is the provocative sentence that greeted me when I clicked on the Amazon.com page for Peter Thiel’s book, Zero to One: Notes on Startups or How to Build the Future. Written with Blake Masters, it has been favourably reviewed by a number of sources and made its way to The New York Times Best Sellers List. I first became aware of the book a couple of months ago while listening to a radio interview. The phrase that caught my attention at the time was, “How do you develop the developed world?” In my opinion, eco-design is key to answering this question. Eco-design has secrets that must be believed. It is inherently holistic, dynamic and future-focused. One of the things I love about eco-design is that it evolves alongside changing conditions rather than remaining static. I refer to this as four-dimensional design as mentioned in last week’s column about food forests. Time – the fourth dimension – is an integral part of eco-design in two primary ways: 1) repeating cycles such as day and night, or the changing of seasons; 2) progressive change over time such as ecological succession. I have faith in eco-design. OK, enough with the flowery language. Let’s get to some examples. Passive solar design makes homes warmer in winter and cooler in summer while cutting operating costs. The main factor in this win-win-win system is seasonal sun angles. A passive solar home is designed to welcome low angle winter sun while excluding high angle summer sun – all with no moving parts. The structure itself is built for seasonal change and day-night cycles. 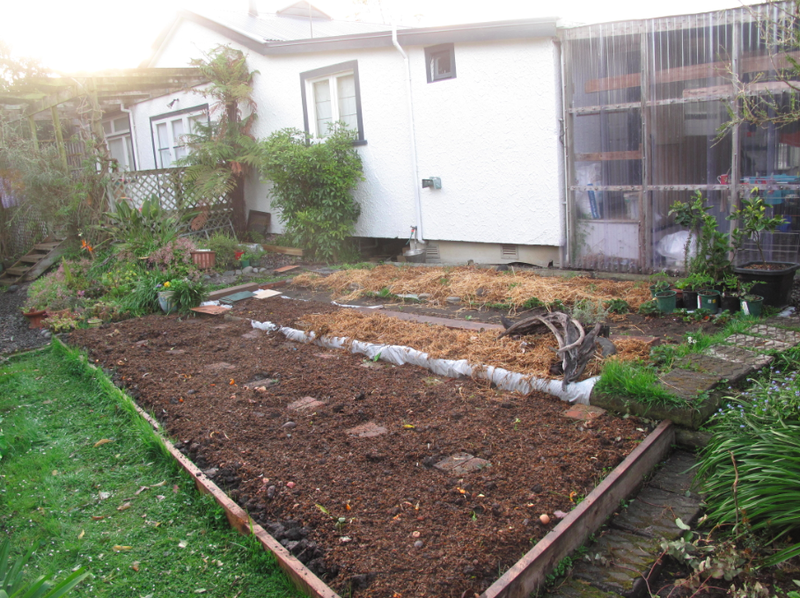 Another example of four-dimensional design is the lazy conversion of lawn into vege garden. By taking it step-wise over time, the total amount of physical labour is minimized by letting nature do most of the “heavy lifting” although in this case it’s digging/tilling. With heavy, compacted soils like we have on our property, a good way to decompress the earth is to plant potatoes. At the same time, adding organic matter helps to lighten clay soils by increasing biological activity. 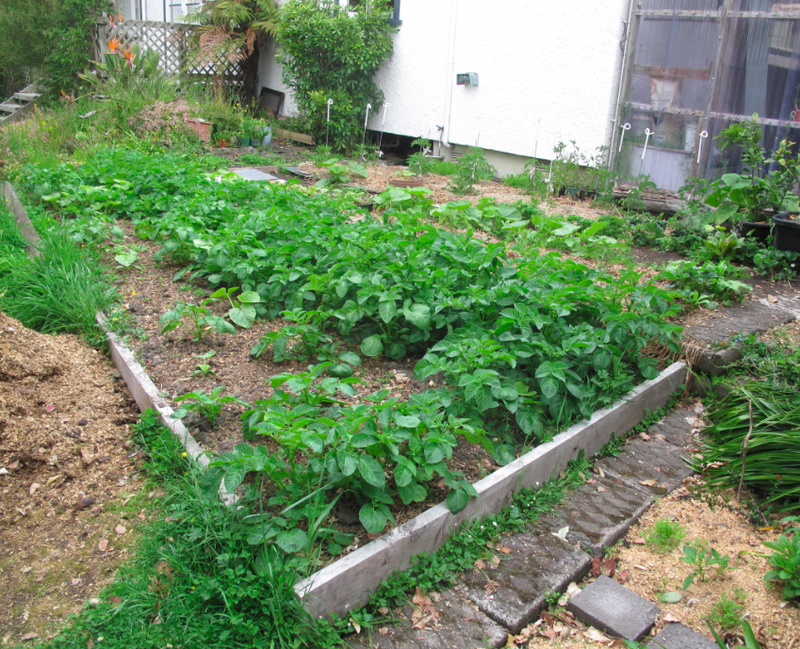 As the potatoes grow taller, we mulch them with more organic matter, which gives us a larger harvest of spuds while contributing even more organic matter to the new garden bed. 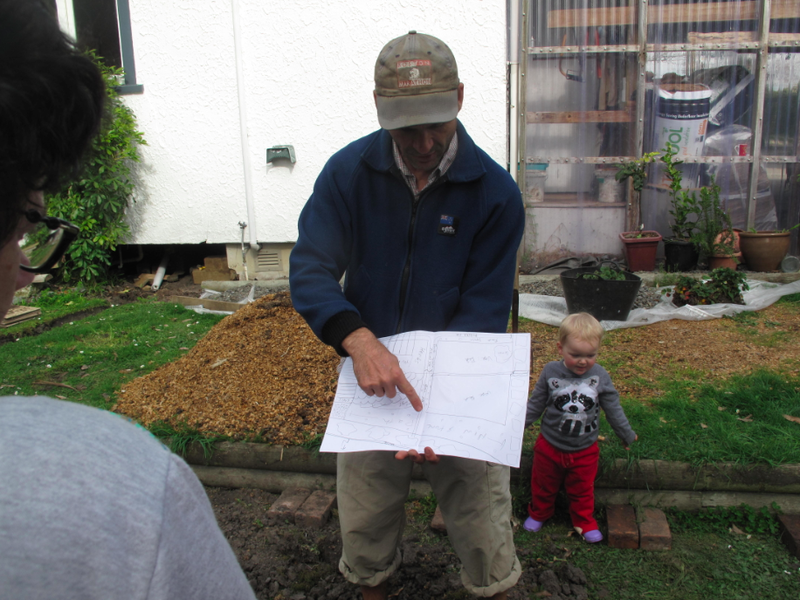 Another aspect of holistic eco-design comes into play when assessing a potential garden area for low-maintenance and high-productivity. 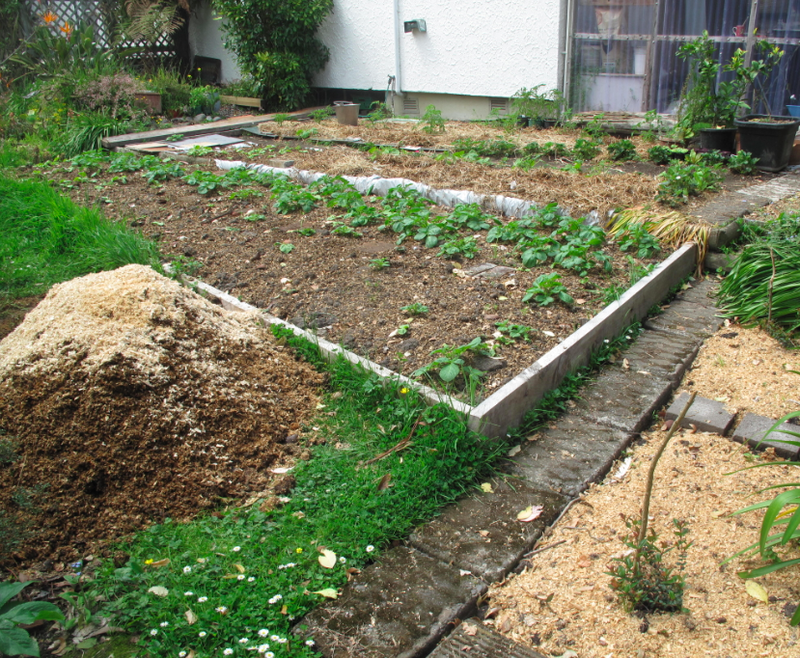 The design of our new kitchen garden concentrates fertility where we want food to grow (the beds) while removing it from where we do not want weeds to grow (the paths). 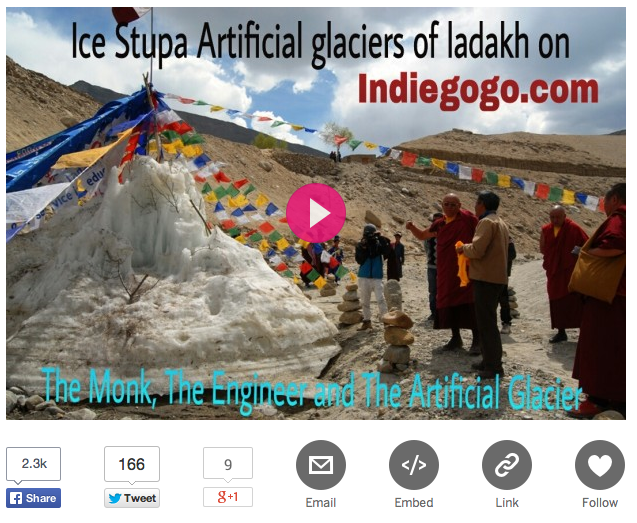 One final note of four-dimensional design: Three weeks ago I mentioned a project being undertaken by my friend in Ladakh, India, called the Ice Stupa Project.